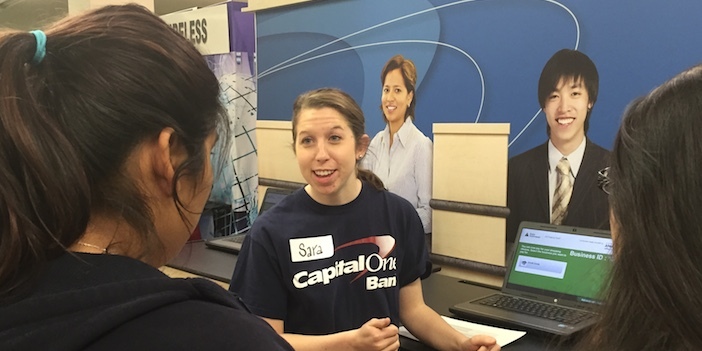 A Capital One Bank employee, and recent college grad, gives helpful advice to students. Yaresi Rodriguez, a student at A. Maceo Smith New Tech High School, had not given much thought to her future personal budget. Rodriguez lives at home, so her parents cover the necessary expenses. However, life after high school is rapidly approaching—along with the groceries, bills, loans, and other necessary costs that come with it—and Rodriguez knows she needs to learn how to manage a personal budget, sooner rather than later. “I know when I move out and start paying my own bills, it might be overwhelming,” she said. 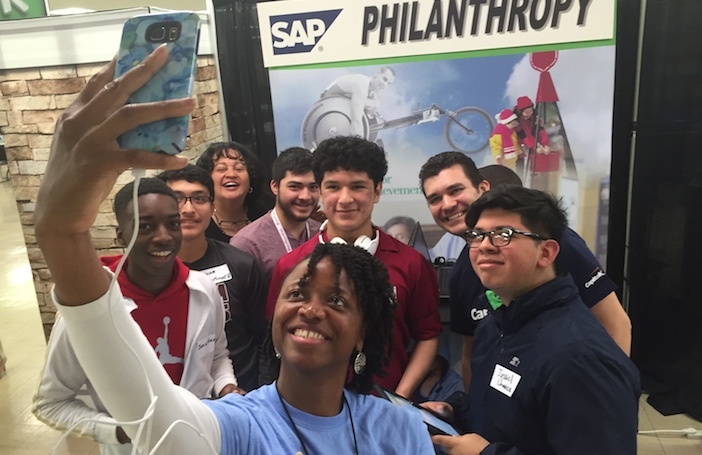 Rodriguez said a financial literacy event presented Friday by Capital One Bank and Junior Achievement of Dallas gave her a much better understanding of how to manage a personal budget. Rodriguez was among the juniors from A. Maceo Smith who visited Junior Achievement’s Finance Park®, which gave the students real world insight into the many parts of a personal budget. A Capital One Junior Achievement Finance Park selfie! Superintendent Michael Hinojosa visited with students at the event about the importance of managing their finances. He thanked Capital One and Junior Achievement of Dallas for providing students with the valuable information. Students at the event used tablets donated by Capital One to go through life-simulated experiences that showed real world, interactive budgeting scenarios. For example, one student was given a scenario of a single parent with two kids and a $35,000 salary. After going through and adding up on the tablet the different bills and expenses the single parent would face, the student said that $35,000 would not be not nearly enough money to get by. Jan Murfield, president of Junior Achievement of Dallas, said the real world budgeting scenarios often have a big impact on students. “You can teach students about doing a budget, but when they get hands-on experience in a real world scenario and see the numbers of what it actually costs to live, those lessons sink in,” Murfield said. Kent Eastman, Capital One Bank Dallas Market President, said he feels proud every time he comes to a Capital One Junior Achievement Finance Park® event. He loves watching students make the connection between an income level, job, and the level of education that leads to that job. “When that light bulb goes off, it prepares them for life and teaches them the importance of education for what they will do and be for the rest of their lives,” Eastman said. Friday’s visit to the Junior Achievement Finance Park® came after the A. Maceo Smith students learned about budgeting and personal finances during 13 teacher-led lessons. Capital One Bank volunteers were on hand at the Finance Park to answer any questions from students.